‘Tallinnted’ Young Enterprise group win People’s Choice Award. 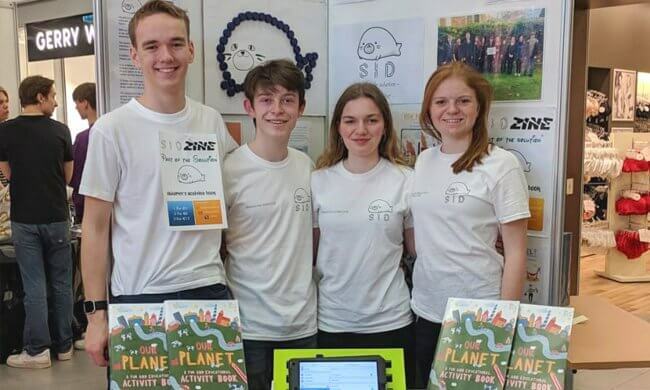 Four 6B students, Grace Francis (WL), Ben Helme (GL), Sam Mutton (MR) and Rosy Waters (MT), competed at a Young Enterprise competition in Tallinn, Estonia. There were 280 teams present from across Europe, and in the end there were only 8 awards given out. The team’s product, an environmental magazine for children aged 5-10 clearly resonated with the judging panel as they picked up two awards. They won the People’s Choice award for most popular company as well as coming in second place for a presentation about how the company is innovative, delivered by Ben and Grace. They spent 3 days in the city, experiencing the sights of the old-town, before their success in the competition on Saturday. A short video promoting the team’s product can be seen below.